Is there a way to apply the Improved WT BUG FIX with this but not have CHKS as a visible stat. Took a bit to get what I wanted but, here is what i did. Now I have an improved WT BUG FIX ROM that shows PIM. I tried running smozrom in Wine for Mac, but it felt like it was taking an eternity for it to open. In short, the application wouldn't open. There is a .py file in the zip. You can probably run that directly in your OS instead of Wine. You may need to install Python 3 onto your system first. When I'm using Python 3, I see a script instead of an application. You claim that I can run it on my OS instead of Wine. invalid syntax probably means you're using python 2 (if it's accompanied by a bunch of programming stuff in the error). If it only says "invalid syntax" then you may be entering the command wrong in the terminal. I already installed Python 3, and I followed the steps given to me in the link... and I still got an invalid syntax error. I tried to give as much info as possible. @Jlnhlsegafan are you on a Mac? It's possible that python3 is not in your path. type "python3" (without quotes), and see if it gives you a prompt. This will open up a file editor window. If not, copy the above, paste it in, then to exit the file editor, press Control and X at the same time. It will prompt you at the bottom of the window if you would like to save, hit the Y button, then press the Return button. Afterwards, you will have to close the Terminal app and open it again. Then try "python3" (without quotes) again. If it works this time and gives you a python prompt, you can type "exit()" (without quotes) to exit, then try the command Smoz gave you again. The info for Python 3 shows up when I type in "python3" in the Terminal. Can you drag-and-drop a ROM file onto smozROM.py? What happens? If there is a syntax error, does it give extra info about it? Make sure you have unzipped the smozROM.zip, so you have all the loose files in a directory. 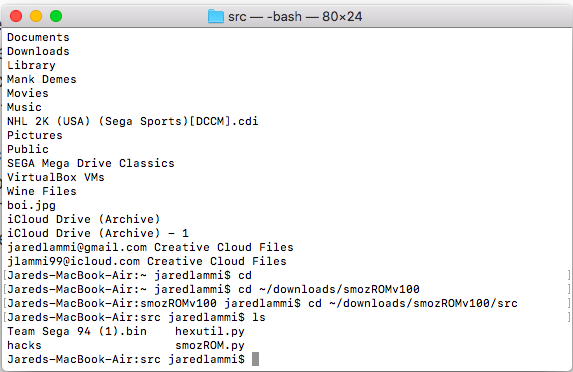 Copy your NHL94 ROM file into the same directory. I don't know what ROM you're using, let's say it's nhl94.bin. Type this command and then press enter: ls (that's LS but in small letters). You should see a list of files, including smozROM.py and your ROM. Any luck? Screenshot of your terminal window? I don't know how to navigate to the src folder using the terminal- I only know how to get there with the Finder. python3 smozROM.py "Team Sega 94 (1).bin"
Ahh I used a windows-specific command in the program. I'll see if I can fix it tomorrow. I have updated smozROM.py and attached it to the first post in this topic. Download it and replace the old one, and try that command again from a couple messages ago. It went well... until this happened. Can you investigate and try to solve the problem? It's not that difficult. I found the missing file. It was outside the src folder.